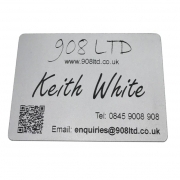 We are pleased to offer packs of 30 BLANK READY TO ENGRAVE aluminum "business card" sized pieces 84mm x 54mm with 1/8" radius corners and deburred silver edges. These cards are available for sale in Gloss or Matt Black. 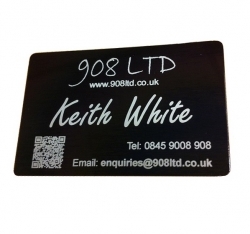 This metal will be supplied ready to engrave with a protective coating to one side only. Which should be removed prior to engraving. Alternatively, if you would like us to laser engrave these cards for you. Please contact us directly with details of exactly what you want on them and we'll provide you details of the addition cost.